I never mind when a company sends me a free coffee recipe… especially when it isn’t linked to a hard sale. 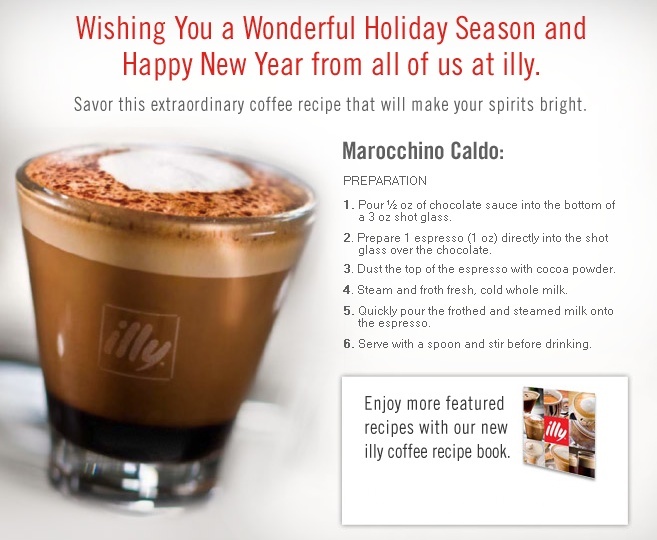 Illy sent an email today giving their recipe for a Marocchino Caldo. It is a pretty simple drink to make and was oh so good this morning! No special equipment needed. Of course, illy does mentioned they have many more coffee drink recipes in a book they have for sale. Since it was a light mention of the book and they didn’t make the email a pressure sale, I feel good about passing on the recipe and passing on an unsolicited mention they offer many more in a 44 page hardcover book. Keep it fun!! Previous post: Amazing Espresso Quantity Mix Graphic!